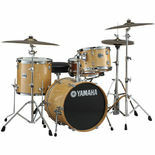 The Yamaha Stage Custom Birch Bebop Drum Set Shell Pack features 100 percent birch shells that offer a cutting low-end sound that balances out with nicely sustained overtones. 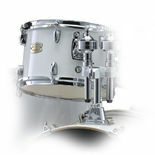 A stunning lacquer finish also aids in the great sustain of this drum set. 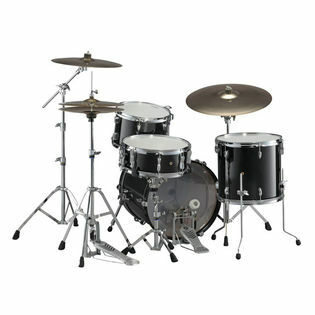 For jazz drummers and educators who need a compact kit for small stages and easy load-ins, the new Stage Custom Birch Bebop drum set fits the bill. I've owned this model (in natural wood) for several years. It sounds great. When my church needed a new kit, and for this price point, the choice was obvious. Just bought it in the honey amber, which is beautiful. I'm sad that this model is no longer manufactured. The 18" x 15" bass drum (one inch longer than many in this size) seems to make all the difference. It give a great thump for its size. It records superbly, and even when mic'd in a large auditorium, it sounds great. I see zero need in the styles I play (worship, gospel, light rock/R&B, country or soft jazz) to lug around a 22" or 24" bass drum, and besides, I can set the mounted tom level with the snare drum, which makes for incredible efficiently in moving around the kit. Bottom line, get one before they're gone. I don't know of any other store that still has these. This kit hits the spot it's aiming for, and then some. It does not have to be just a rehearsal kit. 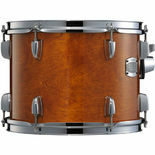 I heard a guitar and drums jazz duo using it, and it sounded full and rich and warm - MUCH more so than I expected from drums of this size and price. I was sure they'd be good, coming from Yamaha, but they were even better than I expected. I had the same response when I heard a high school jazz band use the 5-piece configuration with 20" kick. 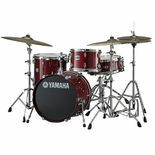 And, I have played the 5-piece with 22" kick, as it is the house kit at a venue my band plays occasionally. They were easy to play, felt and sounded good, and look as good as any other kit. Stage Customs are far and away the best bang for the buck, in their price range. Match 'em with good cymbals and heads, and you're SET!